In a bowl, combine eggs and sugar. Add pumpkin, butter (or oil/applesauce) and vanilla. Bake at 350° for 45-55 minutes or until breads test done. Remove to a wire rack. Yield: 2 loaves. 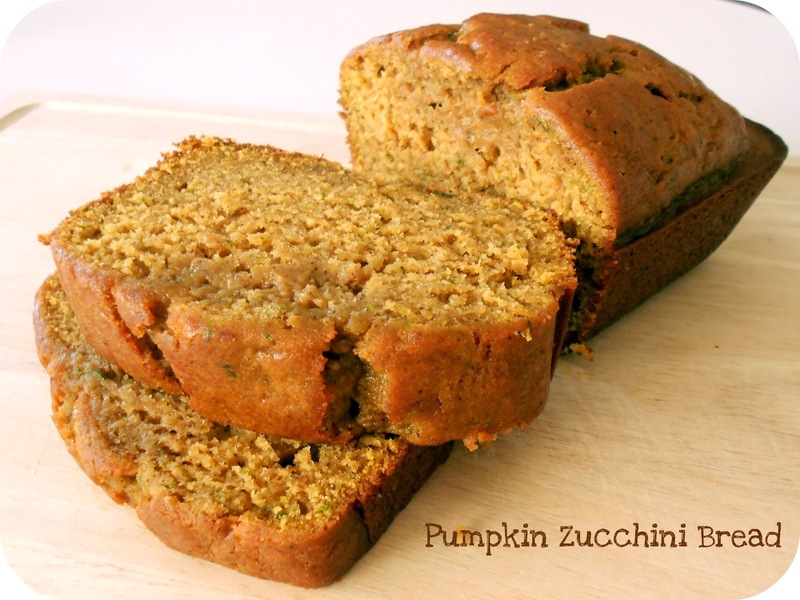 Oh yes, I love zucchini bread, and adding pumpkin to it--I am SO in. :) Thanks for sharing this! oooo yummy! I can almost TASTE IT! Perfect use for the zucchini I shredded and froze, and the pumpkin I'm pureeing and freezing! I can't wait to try this! This looks amazing! I would love it if you would link this up on the 3 month long Sweet Swap linking party that I'm co-hosting. Just jump over to thestokerkitchen.blogspot.com and you'll see the link on the left sidebar!! I just added this to my "batch cooking" list for this upcoming weekend. Also, starting Monday I'm adding a link tool to my "Must Try Monday" posts. You're welcome to link up your "Must Try" recipes. Yummy!! You girls always have the most yummy food!! Oh my goodness...it's my two favorite quick breads come together in one marvelous loaf! Thank you so much for sharing your awesome recipe at Rook No. 17! I am trying this this week! I have so much zucchini in the freezer. So great My family loved it! That is so good ! Quite yummmmyyyyy !! I only had one loaf pan so I put the rest of the batter in cupcake molds. Bake for 25 minutes. AWESOME! This bread is great! What a wonderful flavor!! My kids LOVED it!! Thanks for sharing another great recipe! I made this over the weekend but cut back on the sugar (1/4 cup less each)and used 3/4 cup of vanilla Chobani in place of the oil. Sooooo good. Thank you for this. I've had several people ask where I got the recipe, so I sent them to you! Made this tonight and it was great! Used the oil/applesauce instead of butter since I think it makes a moister bread. Actually used more applesauce than oil. I increased it by 50% since I had extra zucchini and made 4 loaves and baked them for about 54 mins. Thanks for the recipe! I'm sure my friends and son's teacher will thank you also! This recipe is amazing. I have made it multiple times now. I also make them as muffins for work. My coworkers go wild over them. I add chocolate chips sometimes too. The bread was a big hit at the church bake sale. ????? Hello I gave your recipe a try today and I don't know what I did wrong when I finish mixing everything the mixture was so hard to put it on the loaf pans I still did it they came out good but kind of crunchy in the top I followed your directions like u said and it didn't come out looking nothing like the picture I used 1/2 apple sauce 1/2 cup oil? I made this bread as a gift! I gave each loaf away and both recipients loved it. So yummy! Thanks for the great recipe. I am anxious to try out this Pumpkin Zucchini bread recipe. I made this recipe and it turned out fantastic. The only changes I made was I cut the sugar amount by half and I use all applesauce instead of using any oil or butter. I also substituted wheat flour and it still turned out fantasticly. I do think even though I halved the sugar amount I will even use less next time it was still a little too sweet still. Quintessentially Fall y'all!! I baked this for our family last night & we all agree that it will become a part of our baking routine. Thanks! Have you ever used a bundt pan with this recipe? If so, what adjustments did you make, if any? Hi Stacy, I'm sure you could cook this in a bundt pan, I'm not sure if it would be too much batter for one cake. We haven't used a bundt pan before. The main thing would be getting the batter about the same depth as you would in the loaf pan. It might take one batch of experimenting. This is one of our favorite pumpkin bread recipes. Have a great day.